A pair of dice is rolled. Two possible events are rolling a number greater than 8 and rolling an even number. Are these two events mutually exclusive events? Explanation Look at the Sample Space for Dice. 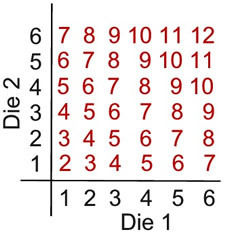 Numbers greater than 8: 9, 10, 11, 12 Even numbers: 2,4,6,8,10,12 The two events SHARE outcomes. They are not mutually exclusive. 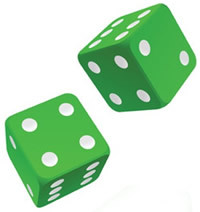 A pair of dice is rolled. 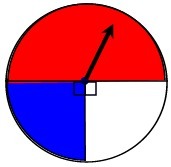 Two possible events are rolling a number less than 5 and rolling a number which is a multiple of 5. Are these two events mutually exclusive? Explanation Look at the Sample Space for Dice. A number less than 5: 2,3,4 A multiple of 5: 5,10 These events do NOT share any outcomes. They ARE mutually exclusive. 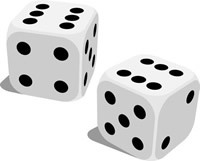 A pair of dice is rolled. A possible event is rolling a multiple of 5. What is the probability of the complement of this event? A pair of dice is rolled. Two possible events are rolling a number which is a multiple of 3 and rolling a number which is a multiple of 5. Are these two events mutually exclusive? Explanation Look at the Sample Space for Dice. Multiple of 5: 5, 10 Multiple of 3: 3, 6, 9, 12 These events do NOT share any outcomes. They ARE mutually exclusive. 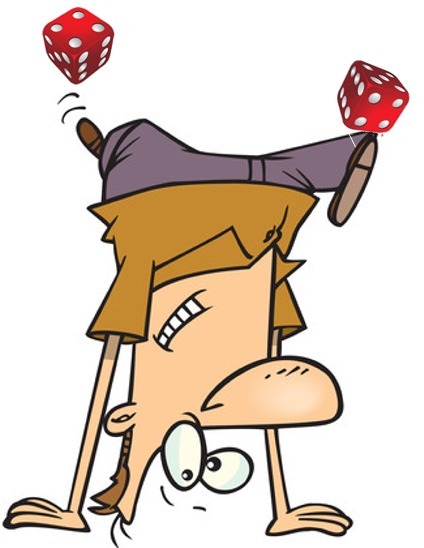 A pair of dice is rolled and the resulting number is odd. Which of the following events is the complement of this event? 1. A number greater than 8 is rolled. 2. An even number is rolled. 3. A number less than 5 is rolled. 4. A multiple of 5 is rolled. Explanation Look at the Sample Space for Dice. All numbers that are NOT odd numbers are even numbers. The correct choice is 2. A paper bag contains 15 slips of paper. Eight of them are blue and are numbered from 1 to 8. Seven of them are red and are numbered from 1 to 7. What is the probability of drawing a slip of paper with an even number? A slip is drawn from the bag and then replaced. A second slip is drawn. Are these two events independent? Explanation By replacing the slip, the sample space for both events remains at 15. The second event is not affected by the first. A possible event is that a blue slip is chosen. What is the probability of the complement of this event? You wish to draw a blue slip on the first draw and a red slip on the second draw. The first slip is NOT replaced after being drawn. Are these events independent? Explanation By not replacing the slip, the sample space for the second event is being affected. 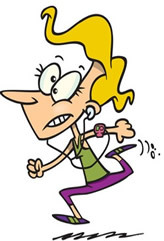 The second event is now dependent upon the outcome of the first event. 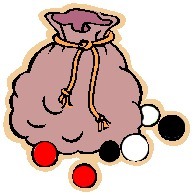 A sack contains marbles of three different colors: 8 black, 6 white, and 4 red. Three marbles are selected at random, without replacement. Find the probability that the selection contains each of the outcomes listed below. Express the answer as a decimal to the nearest hundredth. P(B) = 0.5, and P(A∪B) = 0.8. Determine whether A and B are independent or dependent. 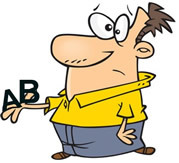 Explanation P(A∪B)=P(A)+P(B)-P(A∩B) 0.8 = 0.6 + 0.5 - P(A∩B) P(A∩B) = 0.3 Def.of Independent: P(A∩B)= P(A)•P(B) 0.3 = 0.6 • 0.5 = 0.3 Independent! Students were surveyed as to which hand was used predominantly for writing. The choices were left-hand, right-hand, or ambidextrous (both hands used equally). For the students surveyed, does this data suggest that gender and preferred writing hand are independent of each other? Explanation Independent Events: P(A|B)=P(A) P(female|left-handed)= 10/25 = 0.4 P(female)= 106/200 = 0.53 These are not equal, so not independent. Checking other options will show the same. A survey asked 150 high school seniors to choose their favorite activity from the choices of snowmobiling, water skiing, and snow skiing. Are the events "student is a male" and "student prefers snowmobiling" independent of each other? Explanation Independent Events: P(A|B)=P(A) P(male|snowmobiling)= 50/80 = 0.625 P(male)= 155/325 = 0.4769230769 These are not equal, so not independent. P(snowmobiling|male)= 50/155 = 0.3225806452 P(snowmobiling)= 80/325 = 0.2461538462 These are not equal, so not independent.